The report also highlighted that the UK currently does not have a clear strategy on global education. GCE UK would like to see the Government develop a new global education strategy that acts on their recommendations, including setting out how it will direct education spending towards improving education systems and reaching the most marginalised out-of-school children. Several parliamentarians attended the event, including Chairman of the International Development Committee Stephen Twigg MP, and following the event APPG Chairman asked parliamentarians from across all parties to join him in writing to the Government. 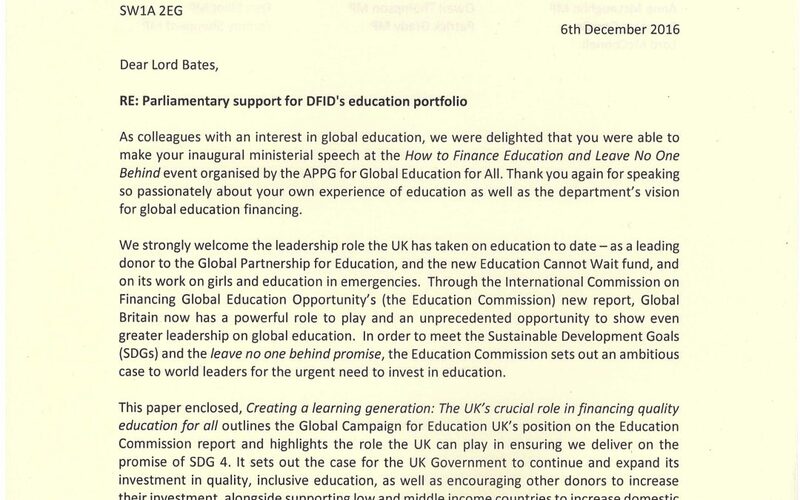 The cross-party group of parliamentarians, some members of the APPG and some not, called on the Government to develop a comprehensive new global education strategy to guide its investments.